1. Organize counter clutter. With limited counter space, you might have to be crafty with how you store frequently used items such as spices, cooking utensils, and fresh produce. Store spices in a spice tower or rack for convenient seasoning and minimal counterspace occupation. Buy (or thrift) a creative looking large cylinder container and put your matching set of spatulas and spoons inside. Try hanging bananas over a bowl with a banana hanger and filling the bowl with fresh fruit for an appealing way to store healthy snacks. 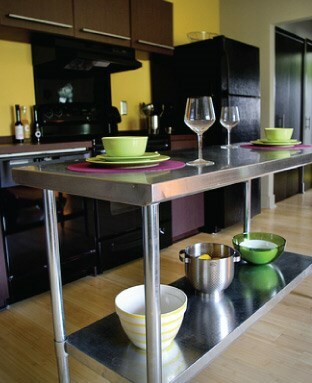 Use the extra counterspace you've created for placing open recipe books while you cook your favorite recipes. 2. If you don't need it, put it somewhere else! It was really nice of your mom to give you that cake pop maker, but let's be honest, you haven't used that thing since her birthday over a year ago. Don't waste precious cabinet space with seldom used small appliances. Find a better location. Our suggestion is to place small appliances on the top shelf of the pantry, high up on laundry room shelves, or under your bed. Just don't forget where you put it, you never know when a cake pop emergency might arise. 3. 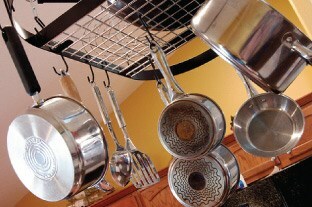 Keep seldom used kitchen tools in the pantry. Buy a plastic bin and label it “Things I Would Use Daily if I Were a Professional Chef,” or maybe just “Fancy Kitchen Tools.” Fill this box up with your turkey baster, rolling pin, gravy ladle, icing tubes, kitchen mixer, and anything else you want to keep handy for your next training session for that show on the cooking channel you've always wanted to be featured on. If you only use a tool once every 50 recipes, why should you have to rummage past it every time you need a spatula? 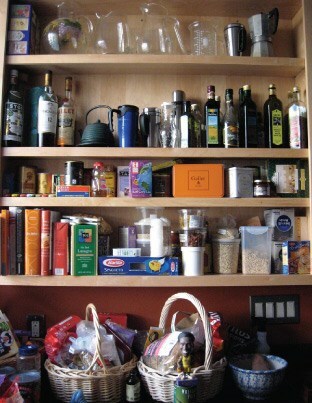 Does the pantry in your new apartment have enough space for your canned goods collection? If you find yourself wanting for space, don't be afraid to add your own shelving. Most apartments allow for holes to be made in walls up to the size of a quarter. You can purchase pantry shelving at your local home improvement store and create your own pantry in your new home's closet that is nearest to the kitchen. Space out shelves to be the size of your favorite cereal box, exactly as tall as canned goods, and spacious enough to fit your favorite bag of chips. Or, if you don't want to screw shelving directly into the wall, buy plastic shelving that stands alone. On a strict budget? Scope out local thrift stores for old book cases or shelving that could be used to store your grocery goods. Don't overcomplicate your kitchen decorations. 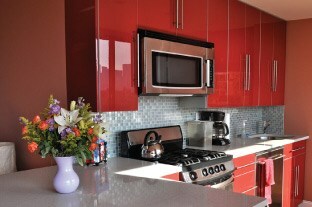 Choose something you love for your kitchen theme. Coffee, Italian food, roosters, wine, family or even bacon… whatever inspires you to cook! Next choose a bright, inspiring color to paint the walls and find towels and rugs to match. Your kitchen should be a space that both inspires your inner chef and makes you happy while you brew a morning cup o' joe.